I just don't want to look back and think " I could have eaten that!" I am a foodie personified. Food has been at the core of my soul and being for a very long time now. Eating out, cooking, entertaining, smelling, seeing, reading learning; all of the above. At the top of my list is eating out, which is possibly one of my favorite things to do, with entertaining a close second. It’s relative, but expensive doesn’t always mean the best though. I bet some of the most expensive dishes in the whole of Asia are probably the dishes that alot of people in the west would consider repulsive. Live shrimps are a big thing at the moment called ‘Goong Ten’ in Thai, which translates to ‘dancing shrimps’. In China and Japan, there’s restaurants that serve semi-prepared whole fish, which is still breathing on the plate. A traditional method still popular today is fermented foods. Fish and egg’s are very popular with the latter called ‘ hundred year old egg’ in China. Iceland also has a delicacy of fermented shark called Hákarl, which smells of strong ammonia, and is reasonably expensive. I’ve never tried it and I’m sure it’s a very acquired taste but as a national dish of Iceland, I’d happily indulge. What’s interesting is the shark in it’s raw form is actually poisonous. At the core of most cuisines and cultures are the basics; the street food, the peasant food and the traditional. Things like noodle soup or rice in Thailand, sticky rice in Laos chicken satay and kaya bread in Malaysia, pottage in Japan and around the world, paella in Spain, sauerkraut Germany, hummus and falafel in the Middle-East, gravad lax in Nordic countries and, err, shepherds pie in the UK, to name a few. Nearly all of these still exist and are predominantly still cheap and delicious with the odd exception. What are now ‘premium’ foods like lobster, oysters, monkfish, foie gras, sushi and the list goes on, weren’t always expensive or premium either. On the contrary in-fact, when lobster started becoming popular in the mid 19th century, they would remove the meat and replace it with monkfish, which could be described as similar in it’s raw prepared state and cooked. Most cultures are proud of their culinary heritage and at the top of that list, I’d say Italy was numero uno with France a close second. Thailand is certainly up there within the top 10. Thai people are very proud of their food which is a huge part of their culture, so much so that a very common question asked first thing in the morning is “Have you eaten yet?”. Thai people have every right to be proud of their food; they seem to have perfected the harmony of balance like they have with many things in Thailand. 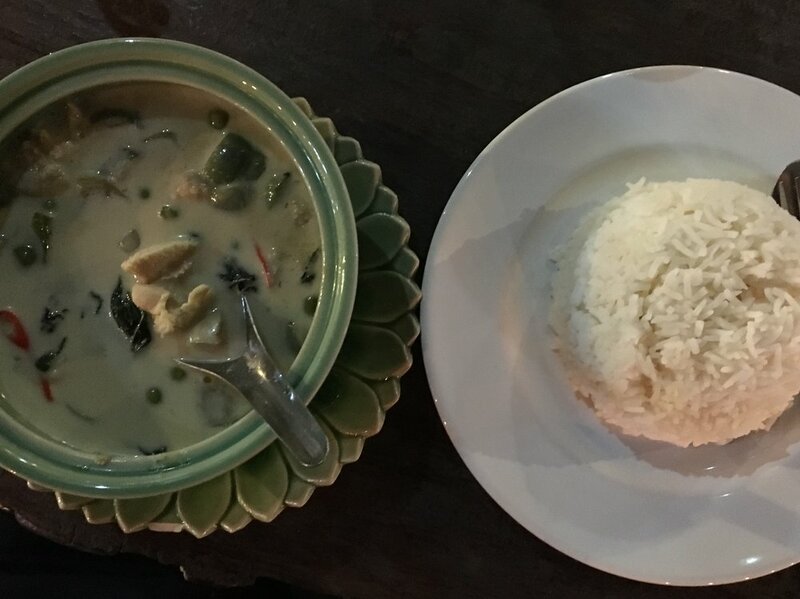 Apart from seeing a butterflied rat on a street food stall in Udon Thani, my introduction into real Thai food has been a smooth one and one without any major surprises. Thai food isn’t necessarily alien to me, with the UK and London, in particular, having its fair share of options, but as with most cuisines, what is re-created by another country, isn't an accurate representation of its origin. Like most cuisines that the UK replicate; Indian, Chinese, Thai etc, is that we tend to misrepresent flavors and dishes, catering to what we in the UK demand and lacking the diverse range of flavors that offer authenticity and origin. Chicken korma or tikka mossala for instance, being more synonymous as an English dish than Indian; well, the way it’s prepared in England that is. The difference in Thai food isn’t as apparent as the example above, but one thing is for sure, the food is much simpler and very regionalized, with each principality offering their take on the traditional dish. Northern Thailand sausage, for example, being proudly different in Lampang, to Chiang Mai, only 100km away from each other. Thai cuisine places an emphasis on lightly prepared dishes with strong aromatic components, with the sweet, sour, spicy and salty being the four fundamental tastes of Thai food. It’s balancing these fours tastes that make’s Thai food so interesting to me. Simple food, relatively simple ingredients, balanced to perfection and more often than not, that balance derived either from the very start, in the form of a paste or at the very end, from the seasonings, and not from the actual cooking itself. I referred to this in my last post. The 4 wonders of seasonings: Fish sauce, sugar, dried chilli and chilli vinegar. Regionality has a huge influence in the different flavours and food on offers, so I can only comment on the North and North East of Thailand towards the Isaan region until I enter the south in 5 months time. 3 things have surprised me about Thai food thus far are 1; how much pork is used and 2) how little coriander is used and 3) just how simple the food is. On the latter; when you look at the number of ingredients on offer, as a chef, my mind wanders off on tangents about how this fruit could be used or how that spinach with a really distinct flavor could be used. Each ingredient is so singularly used here but so distinct in flavor. You’ll find that the types of ingredients that we would use incidentally in our dishes in the west, are used as main components here in Asia. Morning glory for instance seems to be used individually as one dish mainly, unless used in Shabu-shabu cooking. Fried nuts are now even offered as a starter dish for the same price as you would a normal starter. The beauty and the beast of the street food here in Thailand is generally the price, availability and taste of it, the beast in the context of hygiene. My internals have learnt a lesson already. I’ve ridden through some fairly remote places already and the food has been consistently good and safe throughout and it seems cities are the place’s to be cautious. Possibly due in part to the sheer amount of food vendors. 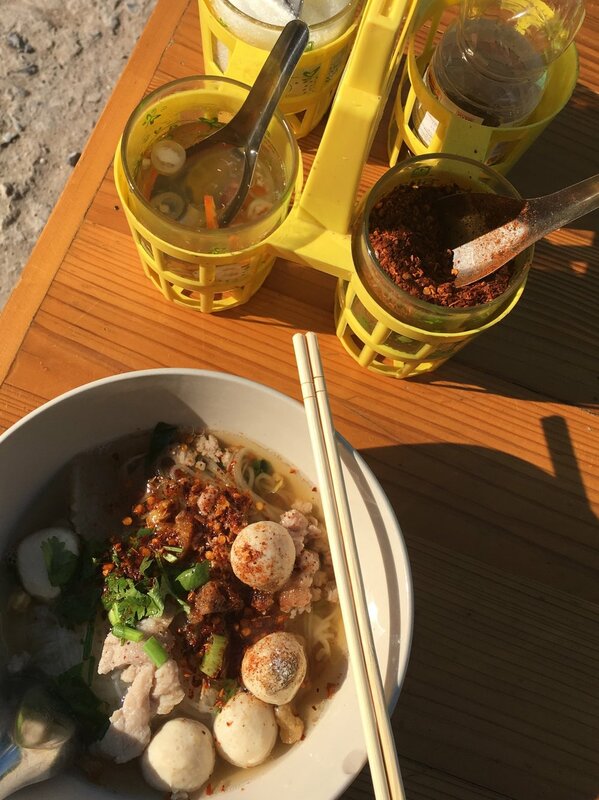 In Udon Thani I had my first introduction to ‘travelers diarrhea’ from pathogenic bacteria which kept me on my toes for a week, and I know exactly what gave me it! I only ordered it because I wanted to take a photo. My experience and knowledge told me halfway through eating that this wasn’t going to end well. Low and behold, I had 7 days of ‘travellers diarrhea’ as it’s commonly known, and it’s not that pleasant. If you are going to pick up any illness in Southeast Asia, it’ll be ‘Travellers Diarrhea’ with 30-50% of people affected by this unfortunate illness. Choosing a street food vendor to eat from can be an overwhelming experience when there’s just so much to choose from, but quality and freshness should always be priority number 1. Use your noddle and have a little think about how long the food might have been sat there. If it’s straight of the coals and piping hot, go for it. Pork satay, crispy chicken, cucumber, chilli and red onion salad and steamed rice. Stewed pork, steamed rice, egg and cabbage. Whilst this isn’t a restaurant, the food was some of the best I ate in Chiang Mai and not because it was cooked by me. For a mere 800baht or £18, you get enough food to feed two normal people and you get to learn how to cook it at the same time. I thought it was excellent value and would highly recommend it. You can find the Khao Soi recipe below. 7. Everything on this table was delicious. My most memorable food experience yet. 4. Khao Tom - Rice soup – Breakfast Chiang Mai Street Food. 10. Takatori Chicken – Chiang Mai cultural night market. 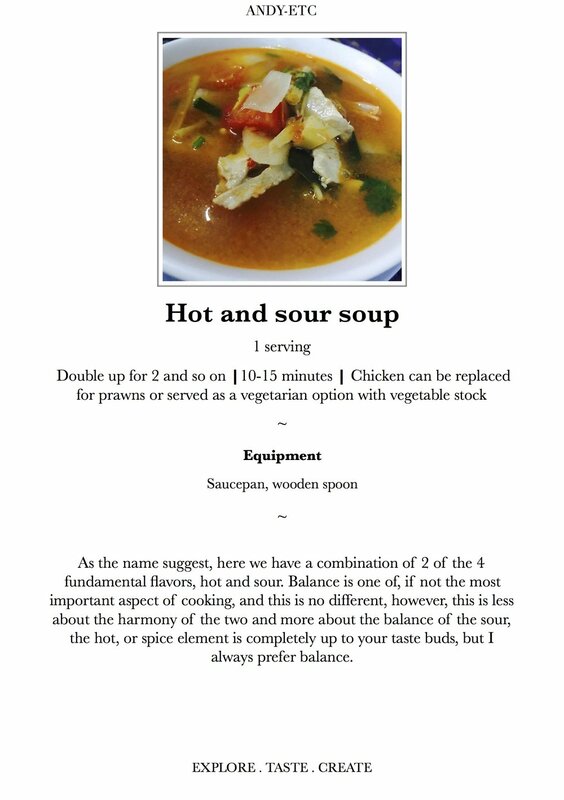 The 3 recipes below are based on recipes I’ve cooked here, seasoned with a bit of my experience and knowledge, and my understanding of what is available in the west. More often than not, the problem with recreating authentic recipes from abroad is ingredient availability. Fortunately, the grocery and product market in the UK has developed in the past 10 years, due in part to higher demand, the e-commerce market and international trade and therefore product availability isn't a problem anymore. With convenience considered, a blender can be used for curry pastes etc, but for a better, authentic flavor, a pestle and mortar is preferred. Why? well, crushing the fibers of ingredients releases the full range of essential oils they contain, and gives chilli sauces and curry pastes a greater depth of flavor than chopping them in a food processor can achieve. This is especially critical when working with fibrous aromatics and roots, such as lemongrass, galangal and kaffir lime peel which appear dry when chopped, but reduce to moist paste when pounded. Also, when these herbs are pounded together, their flavours meld into one, yielding an immensely aromatic and blended paste. Could you or I really tell the difference between pestle and mortar and blender made curries? Possibly not, but it lends itself to a more authentic experience and you get to use the pestle and mortar that you bought, which has otherwise been redundant except for a few corks that you keep in it but end up throwing away after a few months anyway. When you come to making things like papaya salad, a pestle and mortar or similar, is key to drawing out the flavor by bruising the ingredients together without mushing them. Laos' cuisine isn’t too dissimilar to it’s neighboring Thailand and Vietnam on the surface, but once you spend a month there, the differences make themselves obvious. Simplicity is key. Herbs seldom used in Thai cooking make themselves known in Laos cooking, with little bit’s of mint, coriander or basil getting wedged in between the usual spot in your teeth. Laos is famous for 1 thing in particular and that’s its sticky rice (Khao niew). Laotians eat more sticky rice than any other country in the world. Traditionally eaten with your hands by rolling handfuls into balls and dipping into dips and sauces known as ‘jeow’, sticky rice is considered the essence of what it means to be Laos. Most Laos dishes are designed to be shared and accompany sticky rice. To keep fingers clean, and rice from dropping into communal food, dishes do not have a liquid consistency unlike much of Thai food. Noodle soup can’t be far behind, as, when you are traveling in remote places, you’ll find yourself eating noodle soup at least twice a day. Larb, Laab, Lap, Larp, Laap are one and the same. Known as the “unofficial” national dish of Laos, Laap is a cold, meat based salad, with lime, garlic, fish sauce, mint leaves, spring onions and ground toasted rice powder called Khao Khua. The meat can be chicken, pork, turkey, beef, buffalo, duck or fish. This you will also find everywhere and it’s a great dish for those hot day’s, washed down with a chilled Beer Lao. Expect dishes rich with galangal, lemongrass, kaffir lime, garlic and fermented fish sauce. Cooking is traditionally performed over a clay and tin brazier with charcoal as fuel and these are seen everyone, with village people often huddled around them. Ovens as we know them have never been a part of Laos cooking, and I don’t see that changing anytime soon. Steaming and grilling/ barbequing are the most common type of cooking, with the latter offering the smokiness so often found in these foods. 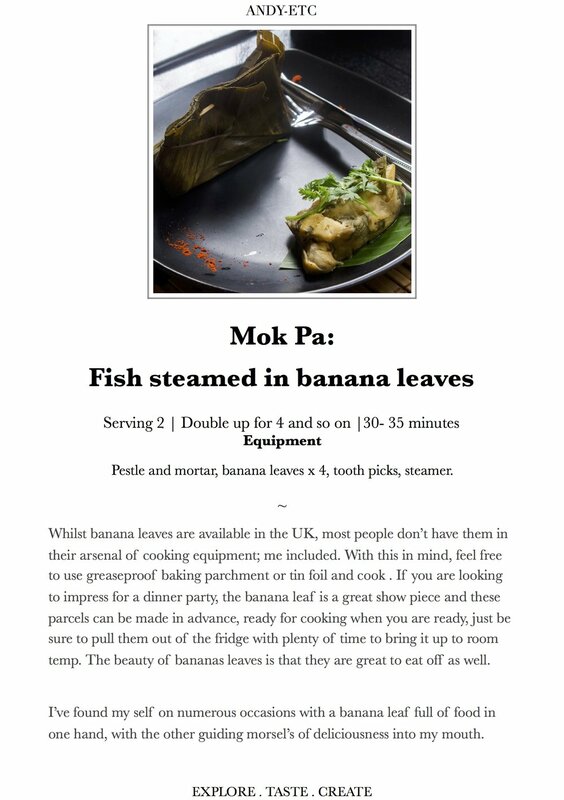 The steaming often using a bamboo steamer or the use of banana leaf for meats and fish. The pestle and mortar, like Thailand, is a fundamental tool in the kitchen and will be found in every single household in Laos I’m sure. Tamarind restaurant in Luang Prabang is known as one of the best and most authentic Laos restaurants around, so I was delighted when I found out they offer cooking classes. What better way to experience the best, than a hands on cookery class. 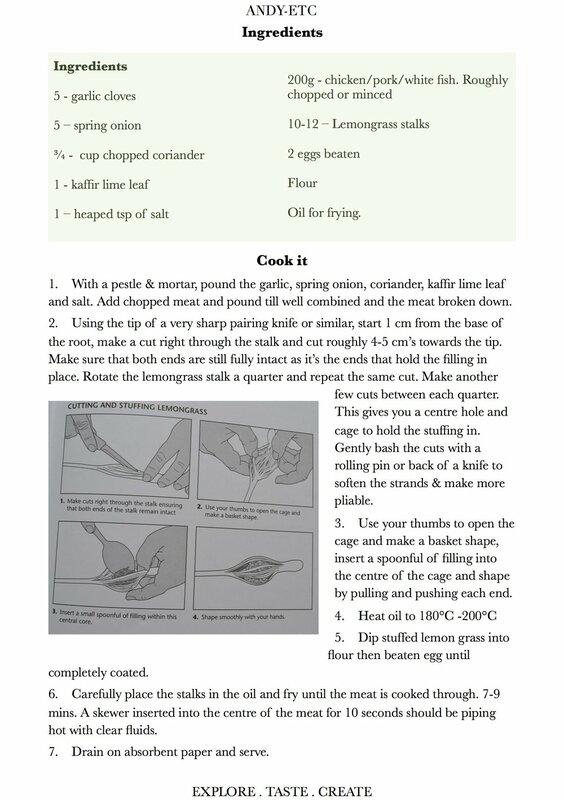 Below I will share 3 of my favorite recipes from my time in Laos and those that can be easily re-created in your kitchen at home. 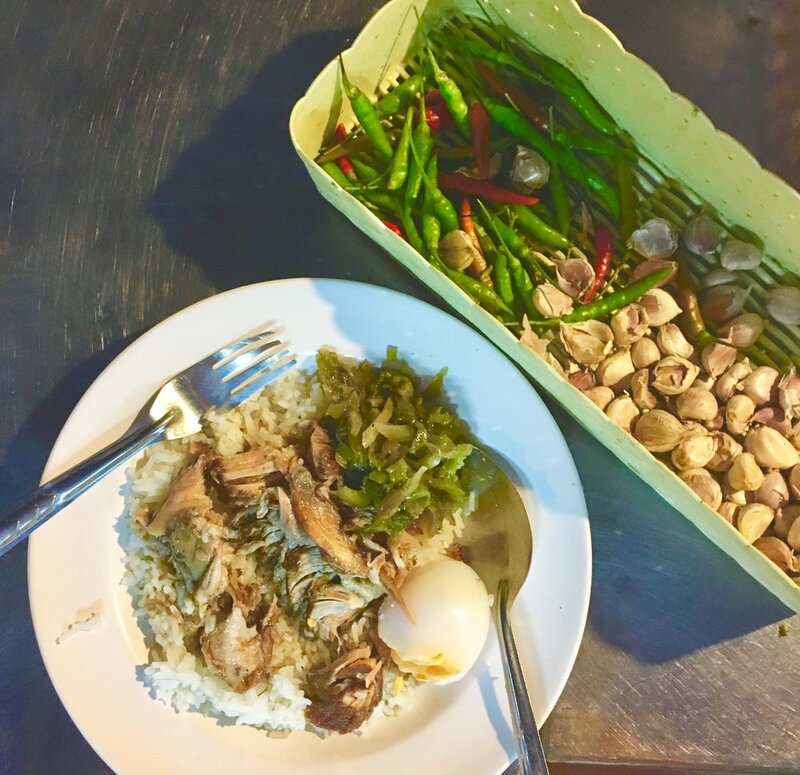 One of my favorite dishes so far on this adventure has been the Jeow Mak Keua, a roasted egg plant/ aubergine dip, usually eaten with balls of sticky rice dipped into the sauce. My favorite version of this was actually in Lampang, Thailand, when I had the unforgettable dining experience with Khun Heng. Evidence of just how far into Northern Thailand the Laos influence has spread. Cooking is like love: it should be entered into with abandon or not at all. And into the wilds of the North I go, to grow stronger than I already know.